An inexpensive portable biosensor has been developed by researchers at Brazil's National Nanotechnology Laboratory with FAPESP's support. 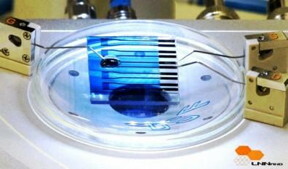 The device is basically a single-layer organic nanometer-scale transistor on a glass slide. It contains the reduced form of the peptide glutathione (GSH), which reacts in a specific way when it comes into contact with the enzyme glutathione S-transferase (GST), linked to Parkinson's, Alzheimer's and breast cancer, among other diseases. The GSH-GST reaction is detected by the transistor, which can be used for diagnostic purposes. "Platforms like this one can be deployed to diagnose complex diseases quickly, safely and relatively cheaply, using nanometer-scale systems to identify molecules of interest in the material analyzed," explained Carlos Cesar Bof Bufon, Head of LNNano's Functional Devices & Systems Lab (DSF) and a member of the research team for the project, whose principal investigator is Lauro Kubota, a professor at the University of Campinas's Chemistry Institute (IQ-UNICAMP). "This is the first time organic transistor technology has been used in detecting the pair GSH-GST, which is important in diagnosing degenerative diseases, for example," he explained. "The device can detect such molecules even when they're present at very low levels in the examined material, thanks to its nanometric sensitivity." A nanometer (nm) is one billionth of a meter (10-9 meter), or one millionth of a millimeter. FAPESP (www.fapesp.br/en) is a public foundation, funded by the taxpayer in the State of São Paulo, with the mission to support research projects in higher education and research institutions, in all fields of knowledge. São Paulo has a population of forty million and generates 35% of Brazil’s GNP. The constitution of the State establishes that 1% of all state taxes belong to the foundation and the government transfers these funds monthly. The stability of the funding and the autonomy of the foundation allow for an efficient management of the resources that has had a sizable impact: while São Paulo has 22% of the Brazilian population and 30% of the scientists with a doctorate in the country, the state responds for 52% of the country’s scientific articles published in international journals.